Namibia is quickly becoming one of the more popular African safari destinations, with its usual collection of predators - lions, cheetahs, wild dogs, jackals, and leopards. But the country is also home to some of the cutest and cuddliest creatures on the planet. Here are the ones I happened across on my recent adventure there. Namibia's Mount Etjo game preserve is home to more than 40 endangered black rhinos and white rhinos. But since both black and white rhinos look grayish black, how do you tell them apart? "White rhinos, the baby always is in front of the mother. 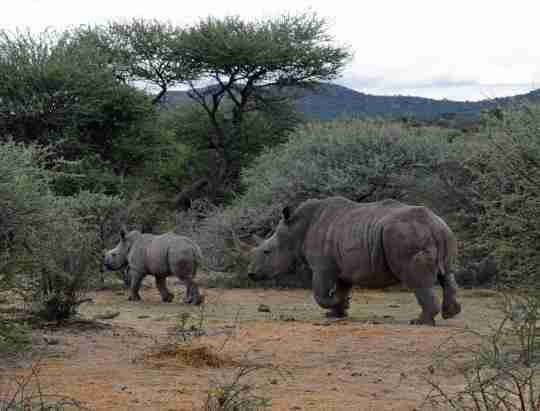 Black rhinos, the baby runs behind," said our guide. "Just like you white people always carry the baby in front, and we blacks carry on our backs." 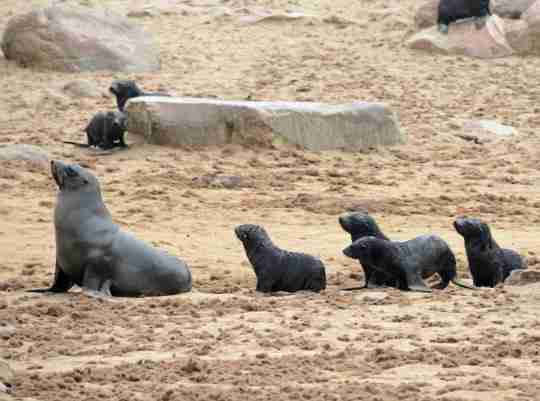 This seal mom with pups was out for a stroll along the beach at Namibia's Cape Cross Seal Reserve. 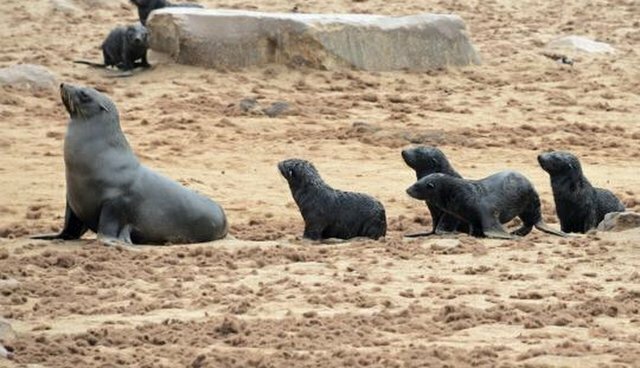 Baby seals look and act like little black labrador dogs with fins, which is quite cute to view, if you don't mind the smell of the other 100,000 seals nearby and the comically insane noise of them all honking at the same time, sounding like 100,000 braying donkeys. This semi-tame meerkat wandered into the desert oasis of the Brandberg Lodge in search of some snacks. When I patted his head, he just went ahead and climbed onto my arm for a cuddle, got himself comfortable, and started napping. When I finally pulled him off, he made a sad "oop-oop-oop" cry. 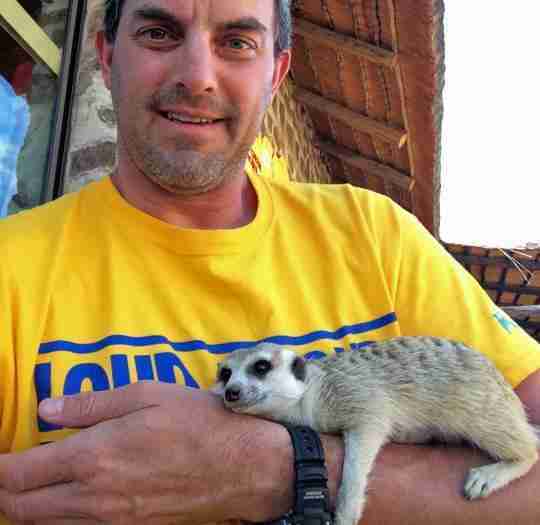 I want a meerkat! 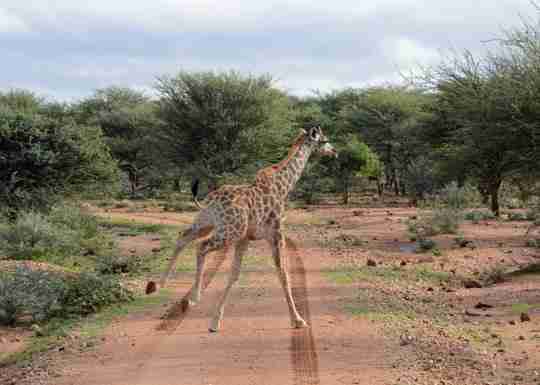 Imagine a 15-foot-tall toddler running for a treat and you'll have an idea what a baby giraffe looks like when it runs. This tyke got separated from its mom across the road from our safari car and then made a run for it, galloping like a wobbly horse on stilts back safely to the trees. This is a lilac-breasted roller, a crazy-bright bird that is camouflaged maybe only when flying into a rainbow. 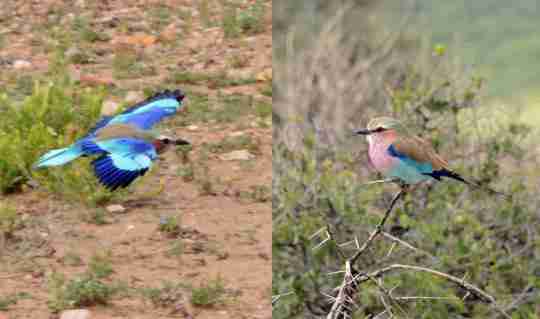 It's the national bird of Kenya and Botswana but gets plenty of flight time in Namibia as well. Did you know cheetahs meow like little kittens when they're hungry? Well this one did, at least. The Cheetah Conservation Fund Center in Namibia takes care of more than 30 cheetahs found injured or orphaned in the wild, rehabilitating and releasing some back to their native habitat. Everyone likes a scratch on the head, even a seal. This is Kamachona, or "Little Boy" in the local Oshiwambo language (he's the one on the left, without the hat). He's learned that boats touring from Walvis Bay usually have some fish to share, so he'll swim up and hop aboard for a treat. 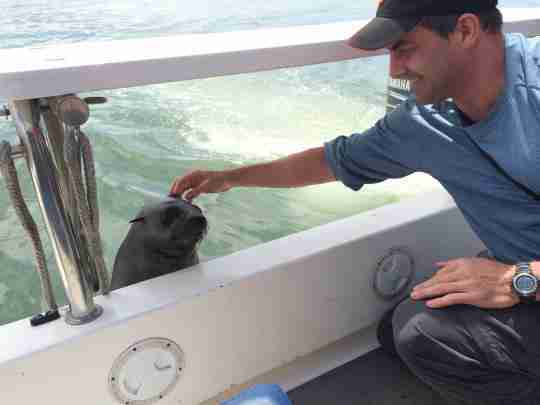 Our captain called him "the most photographed seal in the world." 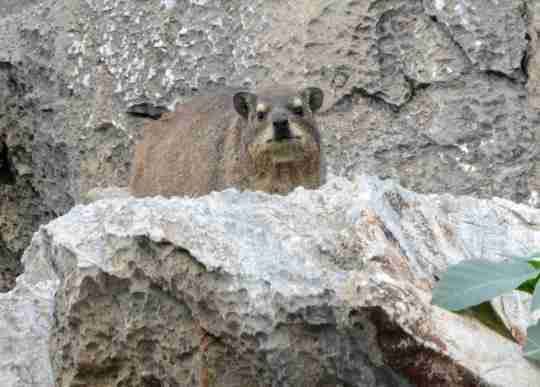 You wouldn't think this chubby little guy could survive long in the wild, but the surprisingly fast-moving rock hyrax flourishes across Namibia. The gerbil-like critter is actually more closely related to the elephant than any rodent species, and the nobility seems to have rubbed off on this one, as he looks a bit annoyed that I have dared to enter his rocky environment. An adult baboon is pretty terrifying close up, with plenty of large teeth and a larger attitude. In Namibia you'll see baboons jogging along roads as if they're out for a training run, sitting on fence posts like they own the place, and of course climbing all over trees and rock formations. This baboon family was just chilling out, taking in the view of a game reserve like tourists out for a holiday. 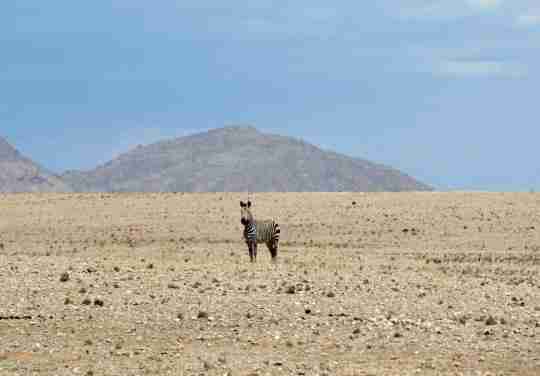 This zebra was just standing there by himself out in the desert of the Namib-Naukluft National Park. Not sure where he was coming from or where he was going, but he was probably thinking something along the lines of, "Hey, man, how about putting down the camera and getting me a drink? Do I look like a camel to you?"